Listen to this recitation in its entirety, best in meditative stillness and receptivity, to this reading of the sublime, Golden Light Sutra. You may listen to the 2nd and 108 times while washing dishes or working on a project. I recommend one download the Sutra and recite it all the way through at least one time during this lifetime. Often I will listen to the Sutra as a final practice at the end of each day. I received the Pratimoksha and Bodhisattva vows from His Holiness, the Dalai Lama in 2015. I recite the Sublime Golden Light Sutra every day as Lama Zopa Rinpoche suggests. I wept when I first read the chapter ‘Confessions’ included in this audio. The sheer beauty and depth of the verses are incredible. I will be glad to dedicate any merit from this practice for anyone who needs to solve a problem. Write to anita.saran@gmail.com. The painting of The Buddha is by me. May those who listen to this recitation have the causes of happiness and eliminate the causes of suffering. The King of Glorious Sutras called the Exalted Sublime Golden Light, also known as The Sutra of Golden Light, is a Mahayana sutra with great power and benefit. Reading the sutra helps bring peace to the world, promotes healing, gives great protection, and most importantly, plants the seed of enlightenment. “Anybody who wants peace in the world should read The Golden Light Sutra. This is a very important practice to stop violence and wars in the world. 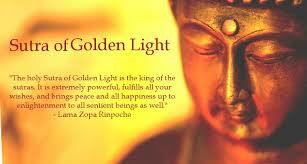 The Golden Light Sutra is one of the most beneficial ways to bring peace. This is something that everyone can do, no matter how busy you are – even if you can read one page a day, or a few lines and in this way continually read The Golden Light Sutra.” –Lama Zopa Rinpoche.